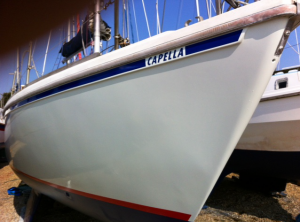 Capella is a bilge/twin keeled yacht built around 1980 and still has her original Volvo Penta MD5 engine. Upgraded and loved by her previous owners she now lives in Ipswich at the Orwell Yacht Club. Life is like the river, ebbing and flowing and rarely smooth. The new battery whizzes out to Capella. Everything is almost set, except the depth sound reads no depth. Tear the boat apart to find the sensor, get the fault finding guide from the Raymarine website (BT 4G on the mooring), still nothing. It worked the week previous, so perhaps there is just something attached to the sensor underneath. There no way of checking with out diving gear, and a diver to put in it so we decide we’ll motor down the channel and sail back on the genoa. We get everything ready to go – but engine is very reluctant to start (started fine yesterday). It took so long we decided we better motor to Pin Mill just to recharge the battery, which we did. We’d gone about 3 boat lengths when the depth sound started working again. hooray! So motoring down to number 4 buoy we passed seal, then a bit later we saw it again, a rare treat to seem them once but we ended up seeing him 3 times on that trip. We rounded No 4 unwound the genoa and started the return leg under sail, but it didn’t last long. We got to No.5 when we lost the wind and started drifting slowly backwards. So back on with the engine and motored all the way back again. Lovely afternoon to be on a boat, just the noise of the engine spoiling it a little. Still lots of season left as yet. It’s Saturday, the sun is shining, tides are right time for the first sail of the season …. or so you’d think. The trip too Capella was eventful, first the battery powering the electric outboard finally gave up any pretence of being useful. We started rowing the last few hundred metres, and then 10m from Capella a rowlock comes unattached from the dinghy. Basically the screws pulled out of the wood and fortunately fell into the boat. So we get on the boat and unload and set about repairing the rowlocks, when Tall Fred give us a shout – have we got a dinghy and can we sort out a mooring line on Jezebel, a few boats along the trot moorings. So I quickly find some screws and screw the rowlock back on and work me way down the trot and sort out the rope wrapped around the rudder (which would possibly break it). That sorted I go back to the mother ship where Wifey has been tidying, but can’t put some of the stuff away as the draws are stuck, they really really don’t want to move. So I remove the whole carcass and eventually we get them out and realise that I had put the carcass back upside down when servicing the engine. By now the wind had picked up – too strong for a first sail really so we set about some of the other odd jobs. I’d bought new top guard rails, but only measure one side and the other was too long. Easiest option was to cut the end off and add a new swageless fitting on the end. That took 3 attempts as there were no instructions, but finally sorted it out. First stop on the way home was Halford to pick up an new 70ah leisure battery, for another attempt at a first sail tomorrow. We have a pressurised water system on Capella, installed by the previous owner. It has been working fine until late last year, come the close season I forgot all about it. The other day I decided to take a look. I could hear the pump running so it had power OK. I checked the pipe was clear, that was OK too. Tested it with water in jug next to the pump, but still nothing. In the end I removed to take home to test. 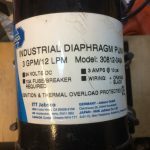 Assuming the diaphragm was probably faulty, I looked make and model to see how much a spare one would cost. 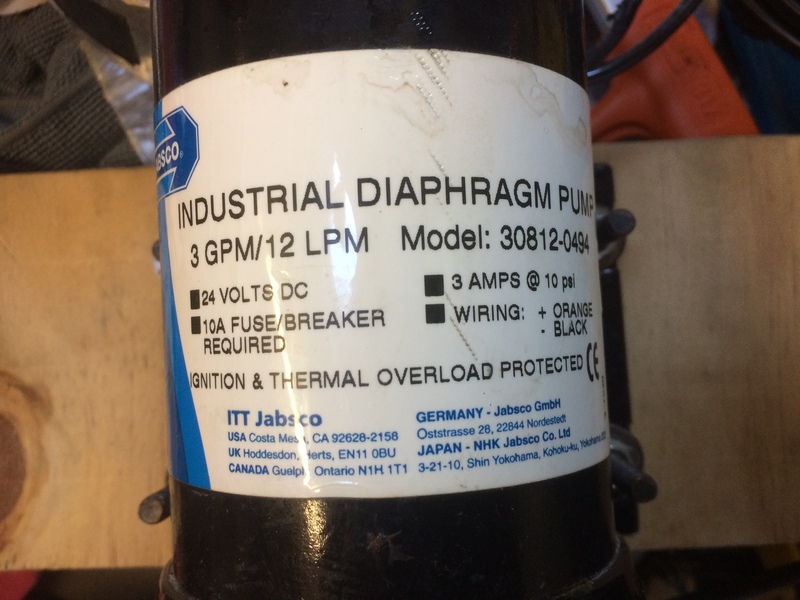 Then I spotted it – it’s a 24v pump being powered by a 12v system! So this 12LPM pump was working at half power. Always the odd little snag of course, but I seem to constantly under estimate the time it will take to do something. So we’ve had to delay the launch a couple of weeks to get all the essentials finished. Now due to go ‘splash’ on the Thursday 11th May, it’s still the earliest launch date since we bought Capella.